A graduate of the Texas A&M School of Veterinary Medicine, Doc Anderson has served as a small animal veterinarian in Waco since 1981. Representative Anderson recently married Lyn Sullivan and they have a son, Thomas. 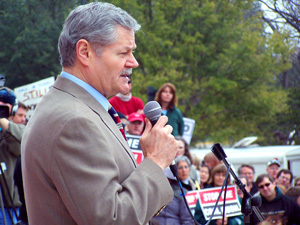 After over 20 years of advocacy for small business through statewide committees on both the Texas Association of Business and the National Federation of Independent Business, as well as appointment by Governor Rick Perry to the Texas Small Business Advisory Council, Doc was elected to represent District 56 (Waco &McLennan County) in 2004. He has been re-elected seven times. the international organization State Agricultural and Rural Leaders (SARL). Dr. Anderson is a Paul Harris Fellow Rotarian. Legislative highlights include: securing new headquarters funding for Company F of the Texas Rangers in Waco, major legislation concerning school bus safety belts, punishment for child predators (Jessica’s Law), legislation banning the hallucinogen salvia divinorum, and a Constitutional Amendment approved by voters in 2011 to extend property tax exemptions to the surviving spouse of veterans who had already gained such exemption due to their 100%, service-connected disability. 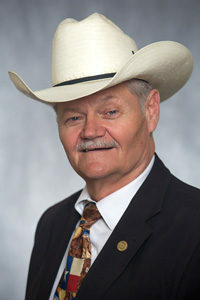 For his efforts to preserve and enhance key local and state institutions, such as the Waco Center for Youth, Texas State Technical College, and rural transportation networks throughout Texas, Rep. Anderson has been honored by the Cenikor Foundation, the Association for Community Transit, Boy Scouts of America, and the Texas Auctioneers Association Legislator of the Year. He is also consistently ranked in the top tier of organizations dedicated to reviewing “pocketbook” issues for Texas taxpayers, including Texas Conservative Coalition, Americans for Prosperity, the Texas Association of Business, and Young Conservatives of Texas. He was also recognized as the outstanding alumnus of Texas A&M College of Veterinary Medicine & Biomedical Sciences in 2014.